Jacksonville, June 17, 2005 - After we landed in Jacksonville International Airport late one evening, we discovered that Delta had a flight to Jerk City at 8:00 the next morning. We know many people from there; we should visit sometime. Ha! I love stuff like that. 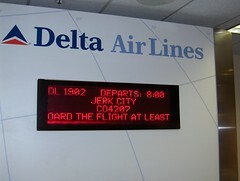 Is the bottom line of the sign imploring the readers to "board the flight at least"? Like, you don't actually have to take off in it...just get on it (yes, you). Well, the bottom line was a scrolling message... but I like the idea of burly airport security men forcing obnoxious passengers onto the plane: "Come with me, ma'am. We're putting you on a one-way flight to Jerk City"
The plane didn't only go to Jerk City - that line also flashed (if I remember correctly) Cincinnati and Dayton.